Learn how to deal with widely dispersed intranets in this deep dive into BranchCache. 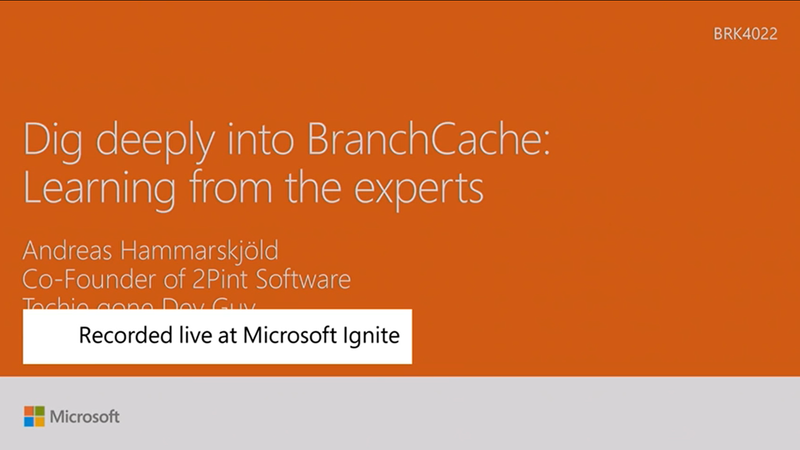 BranchCache has been a part of Microsoft Windows since Windows Server 2008R2 and Windows 7. It helps to reduce the bandwidth consumed and improves end user experience while accessing intranet-based HTTP and SMB content. This session identifies challenges in network performance often faced by remote branch offices which accessing content stored in servers located in DataCenters across trans-continental Wide Area Networks, and how BranchCache helps in addressing these challenges. The session includes details of how this technology works and includes several demonstrations of how this feature behaves in Windows Server 2016 and Windows 10.